Our ancient ancestors moved all over the world and populated the planet without compasses, maps, and certainly not GPS’s. They were close to nature and observed the world around them. They learned to navigate from nature, and natural events. 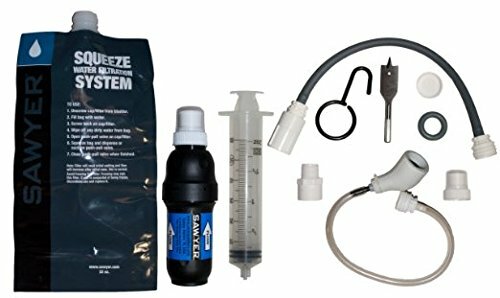 In a SHTF or even TEOTWAWKI, you may have to do the same thing. It basically is a matter of the earth’s relation to the sun. The sun always rises in the East and sets in the West but depending on the season and what hemisphere you are in has an effect on it. In the Northern hemisphere the sun will be due South when at it’s highest peak in the sky, and will be due North at the same time when in the Southern hemisphere. In the Northern hemisphere shadows will move clockwise, and in the Southern hemisphere, counterclockwise. Here are some techniques to use to navigate using these physical facts. Take a stick and place it in the ground as vertical as you can and mark the first shadow in the morning. 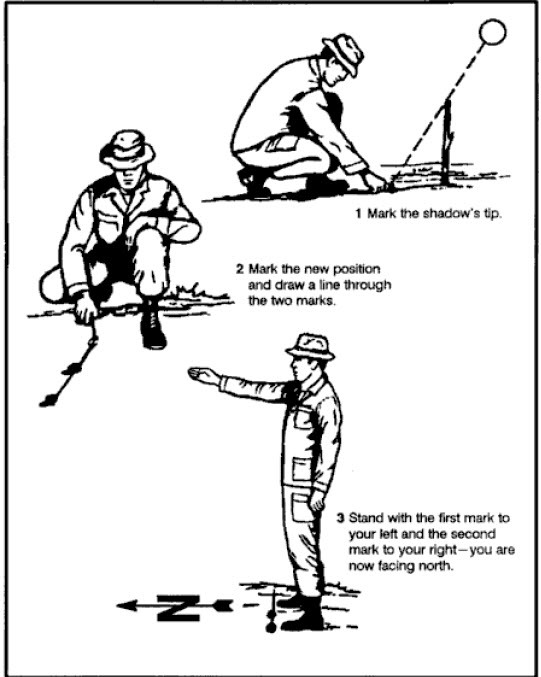 Use a piece of para cord to draw an arc through the first mark and around the stick. At noon the shadow will disappear. In the afternoon it will lengthen again and when it touches the arc, mark that point. You then draw a line from the first mark to the second, and you have an East-West line. You will need to use a watch that has hands and it has to be set to true local time without adjusting for daylight savings time. 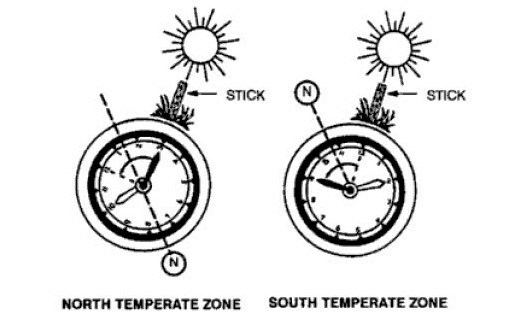 If you are in the northern hemisphere, hold the watch horizontal and point the hour hand at the sun. You can then bisect the angle between the hour hand and the 12 o’clock mark to get a North-South line. In the Southern hemisphere, point the watch 12 o’clock toward the sun and halfway between 12 and the hour hand, you can get a North-South line. If you cannot figure out which is North and which is South, remember the sun always rises in the East. Depending on whether you are in the Northern or Southern hemisphere will determine which star constellations you will use. In the Northern hemisphere you want to find Polaris, the North star. 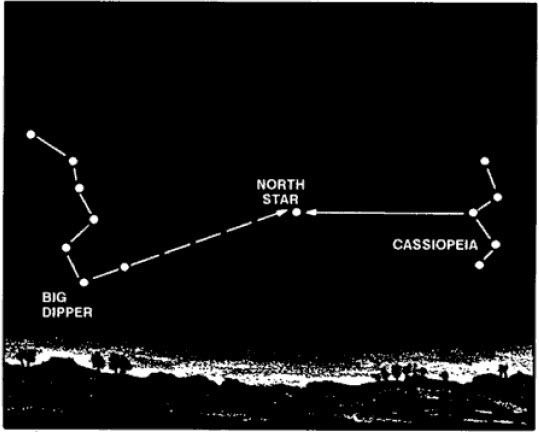 The two constellations you will use are Ursa major (The Big dipper) and Cassiopeia. These two constellations are always directly opposite of each other. The two stars forming the outer lip are the pointer stars to the North star. Draw a mental line from them from them to about five times the distance between the two pointer stars and you will find the North star. This will lead you North. 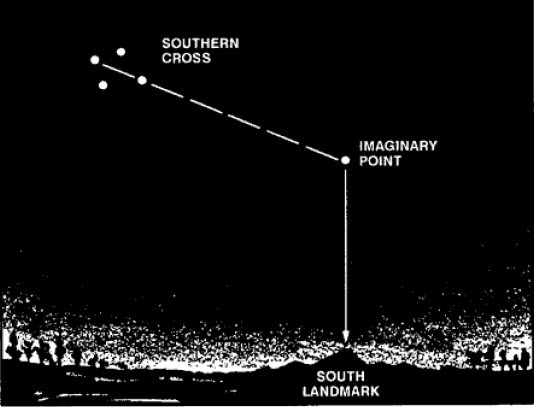 looking for the Southern Cross. It has four stars and the two that make up the cross’s long axis are the pointer stars. Draw an imaginary line between them to a distance of five times that between the two. Where the imaginary line ends is South. Being able to navigate using the sun and stars are skills that every survivalist should learn. If you found this article useful, please click the “Vote for Me” icon at the right of the page. Thanks! One of the things I carry is sewing needles and ALL OF THEM are magnetized with the eye of the needle as the North pole. Simply done, take each needle and stroke it (always the same direction) with a magnet. (other ways involve wrapping it with a coil of insulated wire and passing an electric current through that coil from a low power battery, or rubbing it ‘one way’ in silk or fur). Find a still water puddle (or use a bowl or bucket) and float a leaf or bit of plastic on it. Drop the needle onto the float and it will quietly turn the pointy bit towards the Magnetic North. (Test before the event please). p.s. Magnetic North is NOT the same as Star North or on your map Grid North. Simple multi-usage of a common item. Sewing, removing splinters, and finding North. Magnetized they also cling to each other point to eye. Makes them easier to store. Good technique. I intend to cover it with pictures in a future article about basic land navigation. A lot of folks don’t understand what the declination constant is or what it means in their area. As a side note, the declination constant in the part of Vietnam I was in was 0. Made navigating at night and calling in artillery a lot easier. I used to get caught out with declination the whole time. Comes with using old paper maps and the erratic yearly changes. What is it? One degree of error in a mile is a 100 feet miss. Plays hell with geo caching. I know the Mill Relation Formula is 1 mill=1meter@ 1,0000 meters.